One of the wonderful things about the internet is that it allows people with insane hobbies to demonstrate their outlandish – and sometimes destructive – creations. For example, one German Youtuber has created slingshots that can demolish cars, while elsewhere, a Swedish ‘Let’s-Player‘ has become a multimillionaire shouting over videogames. Our spotlight on all things left-of-the-dial in cyberspace has today fallen on Styropyro, a 22-year-old American student who is fascinated with lasers. 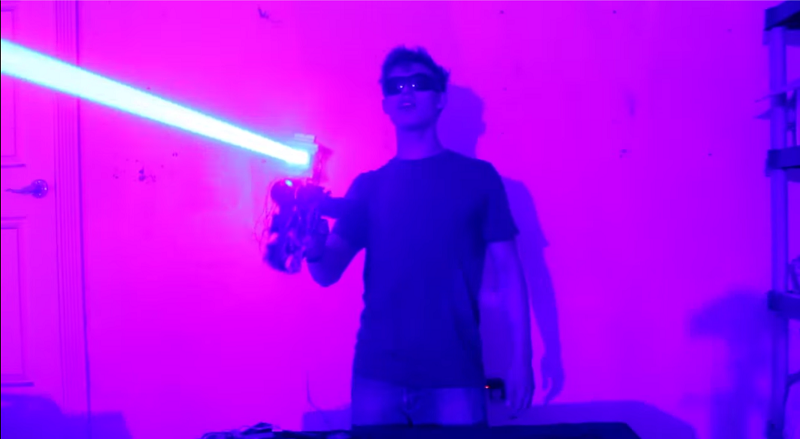 Styropyro, or Drake Anthony to give him his real name, has a history of cobbling together increasingly dangerous laser-based weaponry, and his latest is a 40W “laser shotgun” that blows that little pen laser you had as a kid clean out of the water. Speaking of that little pen laser, they are usually in the 3 to 5 milliwatt range and can cause eye damage in certain conditions. This doomsday laser is 40 000 milliwatts, and even the bloke in the video is wearing special eye protection to save his precious retinas.